Sitting at a typewriter in the attic of the Northampton farm, Donatello feels inclined to try and define who he is into words. Not an easy task, as unlike his brothers, he can’t seem to pin down what makes himself tick. So he opts to simply collect his disparate philosophies together and try to make sense of them. 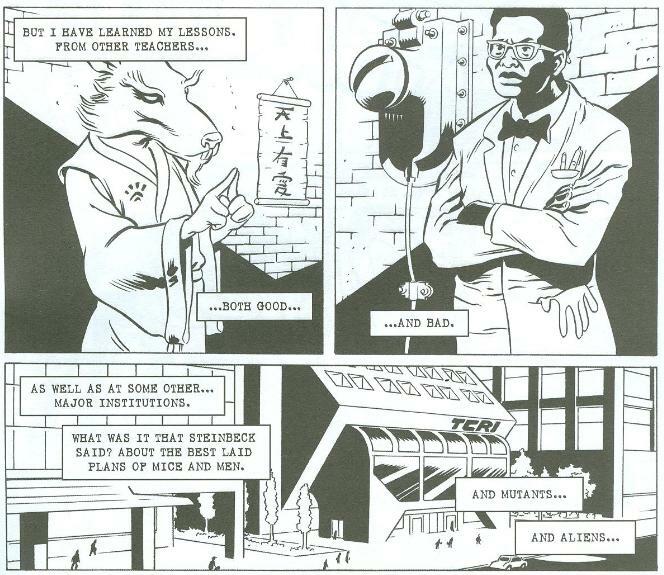 Don considers that everything he knows he didn’t have the luxury of learning in a proper school, but from teachers, both good (Splinter) and bad (Baxter Stockman), as well as some lofty “institutions” (TCRI). He sees the unnatural world as built on models from the natural world (the Foot Soldiers have “bug-eyes” like insects while towering skyscrapers mimic great trees) and that everything incredible began as elemental. He feels there should be a better antonym for “conflict”, perhaps a “proflict”. Looking back on all the friends he’s made in the past couple of years, he realizes that true allies come in all shapes and sizes. He also realizes that practice doesn’t make perfect, only perfect practice makes perfect. However, one should be careful not to obsess over their lesson, should that end up destroying what they endeavor to create. Finally, Don settles on boiling these ideas down to a simple fact: never stop learning or growing. At 16 years of age, he considers this to be his credo. Don signs the paper “February 18th, 1987” and decides to leave it at that. *This story takes place during TMNT (Vol. 1) #11, following the February 17th entry, showing what Donatello was writing on the typewriter in that scene. *Don faced Baxter Stockman in TMNT (Vol. 1) #2, dealt with TCRI in TMNT (Vol. 1) #4 and TMNT (Vol. 1) #7 and fought the Foot Clan in TMNT (Vol. 1) #1 and most recently (to this story) TMNT (Vol. 1) #10. 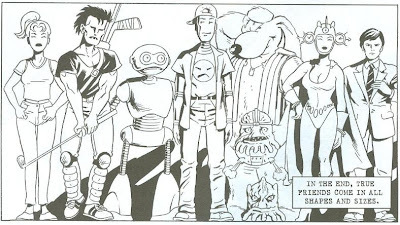 *The group shot of friends on page 5, from left to right: April, Casey, the Fugitoid (TMNT Vol. 1 #5), Gizmo Sprocket, Fluffy Brockleton, an unidentifiable Utrom, another Utrom that looks suspiciously like Ch’Rell from the 4Kids cartoon, Renet (TMNT Vol. 1 #8) and Hattori (TMNT Vol. 1 #9). 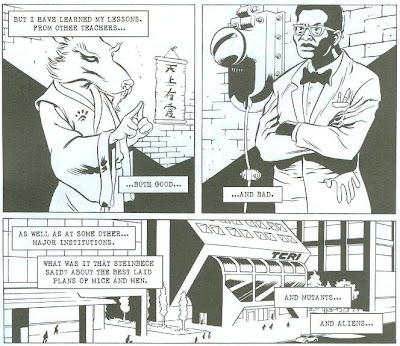 *Incidentally, aside from pin-ups of the Turtles and Gizmo by Michael Dooney published in TMNT (Vol. 1) #9 and TMNT (Vol. 1) #13, the Turtles have never actually met Gizmo or Fluffy. Renet would appear in a Gizmo story, “King for a Day”, while the Fugitoid would meet Gizmo and Fluffy in Gizmo and the Fugitoid #1. How the Turtles met him remains an untold tale, apparently. *The story "Thoughts on Paper" is a nice companion piece to this one and takes place roughly around the same time. *This is part of a series of character-themed back-ups by Tupper, the others being “The Mother of All Anger”, “Secret Spirit”, “Practical Jokes”, “Fathers and Daughters” and "Conflict Resolution". 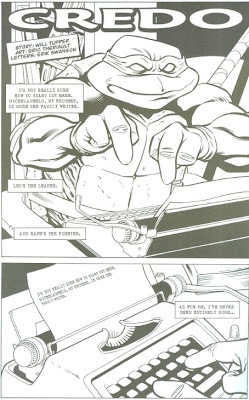 I found Will Tupper’s character dissections of the core TMNT cast to be some very intriguing back-ups and always a joy to encounter during the run of Tales of the TMNT (Vol. 2). “Credo”, though, is likely my favorite of them all. I think what gives it that extra boost is the fact that it fills a small narrative gap left incomplete during the early days of TMNT (Vol. 1). In TMNT #11, April hears Don typing furiously in his attic study and ponders what he’s writing. The only glimpse we see is Don standing by a window with crumpled-up paper littering the floor, apparently unable to properly articulate whatever it is he was trying to write. Eastman and Laird never revisited this mystery and just what creative project was eating away at Don went unanswered for almost exactly twenty years, comparing publication dates. What Tupper comes up with is a very well-researched and well-executed vignette that fits the narrative of TMNT #11 like a glove. At that point in the series, the Turtles were recovering from their defeat at the hands of the Shredder and were each dealing with the loss in their own way. The Turtles spend the five months covered in TMNT #11 basically trying to “rediscover themselves”, drifting apart in order to do so. “Credo” shows Don, the logical and science-minded Turtle, trying to quantify his very essence into words and frustratingly failing to do what’s basically the impossible. So what we get is Don listing the various philosophies and observations he finds the most profound, and that when taken as a whole, they might help define his character. Don’s musings are accompanied by visuals that help to put an image to his often abstract words, and in that regard, artist Eric Theriault does a great job of matching the spirit of the prose. I particularly liked page 6, where Don warns that practice can lead to obsession which inevitably leads to destruction; this was personified appropriately with Leonardo, perfecting his swordsmanship to the point of destroying a tree in his zeal. 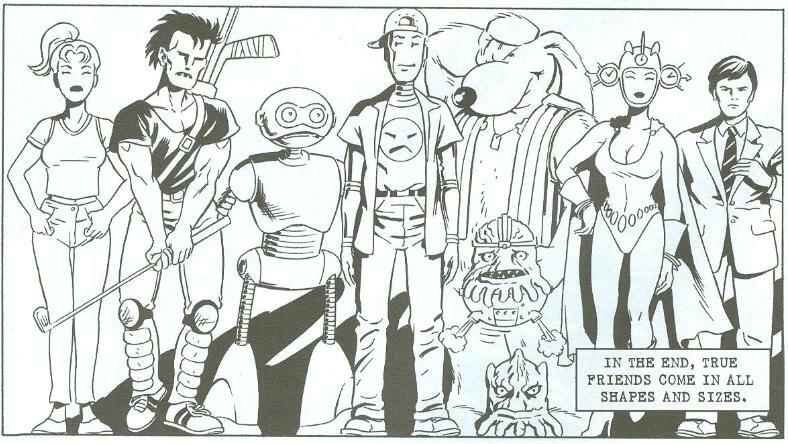 The line-up of Don’s friends and acquaintances is a little… strange, thanks to the inclusion of Gizmo and Fluffy. The fact that we never got a proper Gizmo/Turtles crossover is a rather bizarre mystery to me, as such a thing would seem like a given, but ah well. It’s kinda satisfying to know that they met somewhere, at sometime. Hey, maybe that pin-up from TMNT #9 is canon, now! Would've been cool if Kirby had made the cut, in retrospect. “Credo” is my favorite of all of Tupper’s introspective character dissections and an excellent accompaniment to TMNT #11, sewing up a loose thread you may not have noticed was there but certainly needed the attention. This was a great bid. Tupper really knew how to mine the archives of TMNT lore for some genuine gold nuggets. My only critique of this story is that it seems Eric Theriault wasn't on the same page as he was, seemingly more immediately influenced by the 4Kids TV show than the vintage Mirage look & feel. And believe it or not, until I read your review of #11, I had no idea why this story was dated specifically... or when it fit into the Mirage timeline (given how many times we see the turtles in Northampton). Great job weaving it all together, Mark.